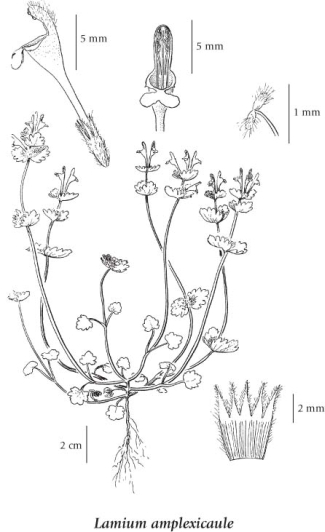 Annual herb from a short taproot; stems slender, weak, ascending or reclining with tips ascending, 10-40 cm long, generally branched from the base, glabrous to inconspicuously hairy, 4-angled. Opposite, rounded to egg- or heart-shaped, 1-2 cm long, 1-3 cm wide, margins coarsely blunt-toothed or with small lobes, hairy on upper surface; lower leaves stalked, upper leaves unstalked and clasping. Inflorescence of several well-spaced flower clusters in axils of leaf-like bracts, the bracts unstalked, usually wider than long; corollas tubular, purplish, 12-18 mm long, glabrous inside, hairy outside, strongly 2-lipped, the upper corolla lip erect, oval, hood-like, hairy, 3-5 mm long, the middle lobe of lower corolla lip spotted, the lateral lobes very small, represented by a short tooth; calyces 5-8 mm long, 5-veined, the teeth narrow and erect with pointed tips, about the length of the tube, hairy; occasional plants produce small, unopened flowers. Nutlets, 4 clustered together, three-angled, squared-off at tips. Mesic to dry waste places and grassy fields in the lowland to montane zones; frequent in SW BC, rare northward and eastward; introduced from Eurasia.